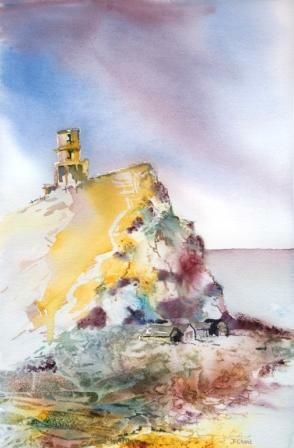 Jo likes to paint in watercolour, acrylic or mixed media, bold and vibrant paintings of local landmarks, buildings, street scenes, and also abstracted natural forms. Colour is very important to Jo, who uses painting as a therapy and leveller of life, dealing with a chronic and debilitating health issue her art has kept her outlook on life a positive one. She hopes to inspire others to take to something creative as a means of destressing and letting go of thought processes that can easily lead to depression and anxiety. If you would like to find out more about this please take a look at her website.Jo took up painting in 2006 after being diagnosed with a progressive neurological condition. She has found her passion in life for painting and loves to immerse herself in the fun and excitement of seeing how a painting turns out. She lives in Hampshire with her husband and two teenage sons. She has exhibited in local art shows and takes part in the Hampshire Open Studios. Her studio is open for viewing by appointment and there are many different sized paintings on show from £40 upwards. Commissions are undertaken from £80 mounted.